Antasma X is the upgraded version of Antasma in the game Mario & Luigi: Dream Team. 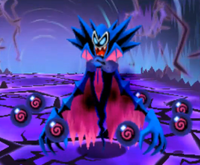 He appears in the Battle Ring as one of the bosses of Class 2 with Bowser, and Class 8 alone. 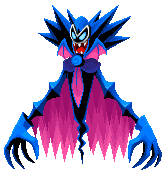 As with many X bosses, his color palette has been changed. In Class 2 his eyes are changed from yellow to pink while his wings and body are changed from pink and purple to gray and yellow. In Class 8 instead of purple on his body and cloak, it is blue and his eyes are light blue. Antasma X in Class 2 attacks identically but has higher stats. Antasma X's powers in Class 8 are the same as Antasma's true form, but his stats have increased, and he is much faster than before. When he captures Dreamy Luigi, he is more than likely to eat the Antasmunchie X with him in it. Additionally, the dream section is longer and the saws are more plentiful and hazardous than last time. Mrakula+ From "Mrak" meaning Gloom and Dracula, a fictional Vampire count. This page was last edited on November 21, 2018, at 14:26.